There are many species of locusts around the world. Over twenty thousand have been identified and over one thousand exist in the United States alone. Locusts are strong jumpers and they can fly. Though they don’t bite intentionally, they have been known to “chew” a person or two during migration or prolonged contact. Locusts are strong insects with a body well protected and sight which enables them to identify predators from afar. 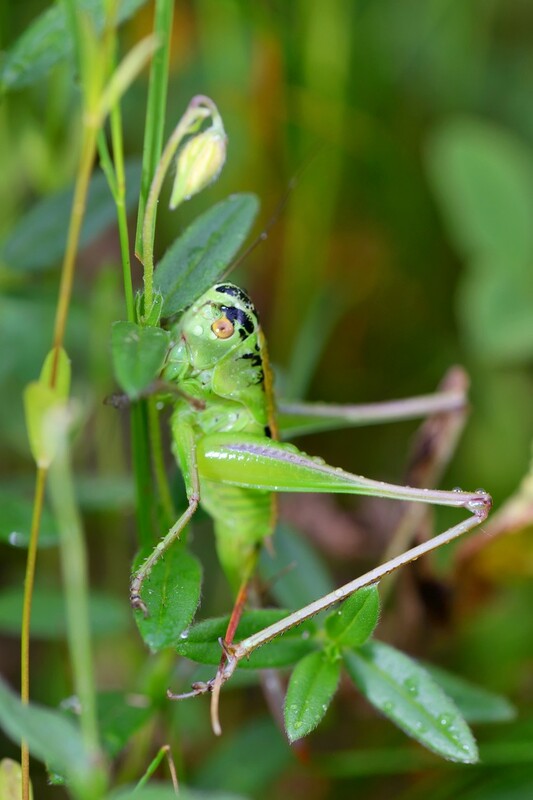 Closely related to crickets, these ferocious and crop damaging pests know how to “sing” and “chirp”. This article will detail some basic biology of locusts, list why they are a pest and then offer solutions on how to keep them away from your gardens and plants. Locusts are known around the world as they occupy all populated regions. They are great jumpers and most species can fly as well. They have a tough outer-skin which affords them great protection. Pygmy locusts are the least important. They are small with thin bodies which has a dorsal shield completely protecting it. Though they do some damage, Pygmy locusts are thought to have the lease amount of impact. 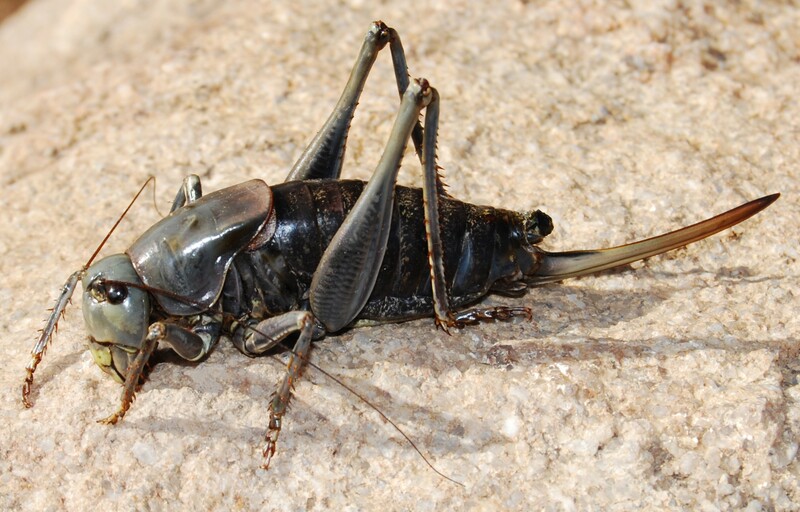 Longhorned locusts are much larger and have antennae which extends beyond the end of their body when folded back. 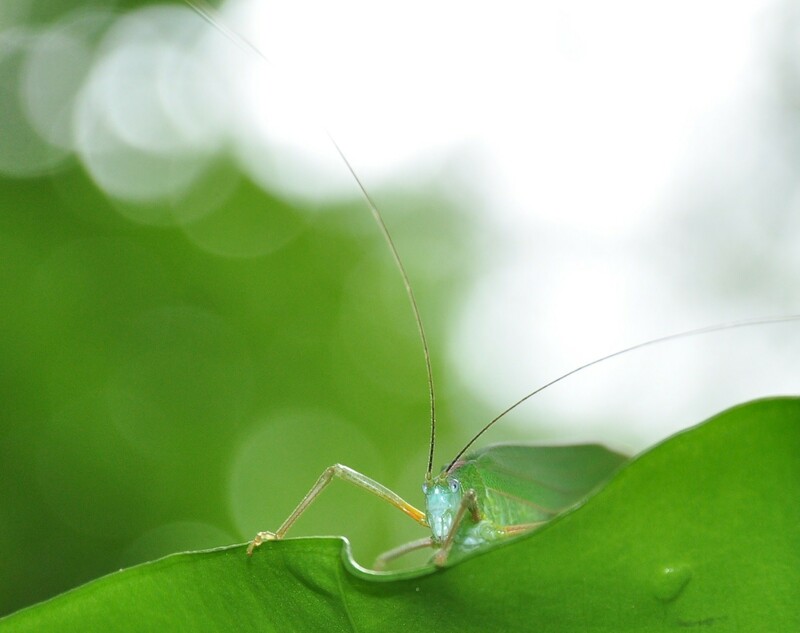 Katydids, Cone-headed Locusts and Meadow Locusts are all members of this family. 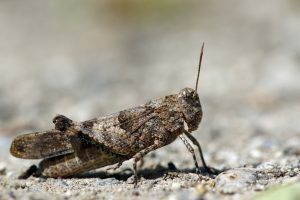 Long horned locusts do a lot of damage every year; the Mormon Locust was a meadow locust which was responsible for so much damage which early settlers endured while farming Utah. The shorthorned locust is by far the most common of all species and has short antennae. This species includes the Spur-throated locust which is able to molt and migrate when local food supplies are not sufficient. These are the true “locusts” which will leave in late summer/early fall in search of food. They will fly miles and miles when local food is scarce or if they reproduced too much for local conditions to support. 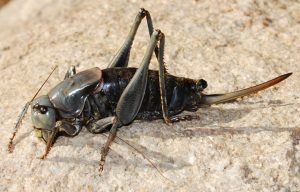 Slant faced crickets and Band-Winged locusts are also in the short horned species. 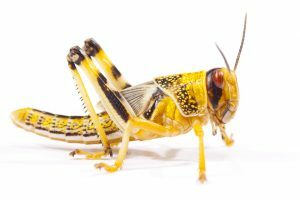 Locusts vary in color. This will depend largely on local environments. Dry arid environments tend to produce more species which are tan to brown in color. Moist, succulent terrain will have more green locusts. However, many species will start a season green and turn brown as the summer lags on into fall. Most locusts are great songsters. Males will use sound during courtship and so distinctive is their voice that many people are able to identify the species just by their song alone! Shorthorned species are only able to sing by rubbing various body parts together so they are really only able to “chirp”. However, both females and males will use sound throughout the year. It is believed their song is used to communicate food locations, mating seasons and the general state of local populations. 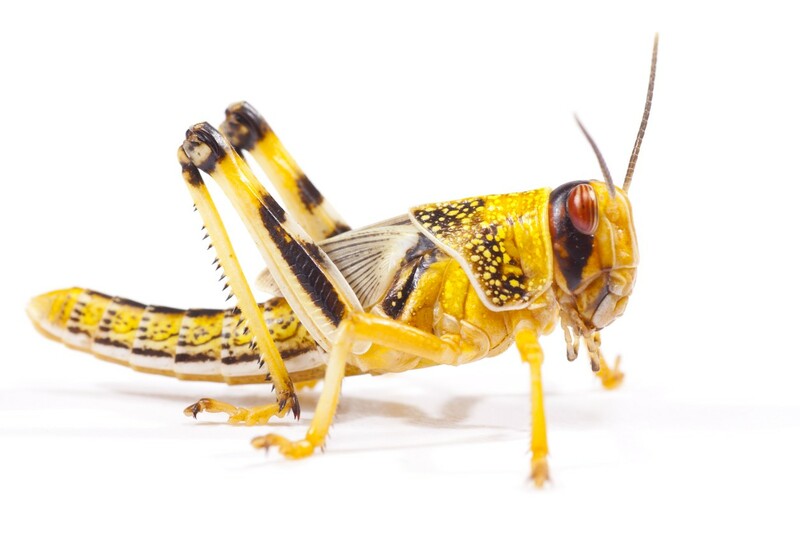 Locusts have well developed ears which enable their sound to find the right target from great distances. It is clear their use of sound keeps them close together which is essential for species development and survival. Most locusts will die by winter and start from eggs the following year. Pygmy locusts are one of the only species which overwinters and emerges as adults in the spring. What little damage they do is mostly noted at the beginning of the growing season. Most other species will emerge as nymphs in the spring looking like adults but lacking the ability to fly. As they molt through the summer they will reach adulthood late in the season. Once they mate, females will use their ovipositors to lay eggs in plants or the ground, depending on the species. This egg laying process causes great damage to plants. Eggs will then lie dormant through the winter and young will emerge at the beginning of the new growing season the following year. Locusts are known for the damage they do while eating. They have strong chewing mouth parts along with ferocious appetites. Locusts have been known to clear acres of crops, wild terrain and urban landscaping. At times they appear to eat whatever is in their path. This is particularly true when short horned species change over to locusts and migrate. 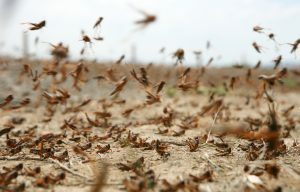 Generally caused by overpopulation or lack of food, locusts are strong flyers and capable of causing uncontrollable damage. There is a certain feeling of helplessness many farmers have felt when they see the great bands of locusts descending upon their crops. Locusts act quickly and will sometimes eat entire plants; other times they ravish randomly. Small local populations are easy to control; large migrating locusts are difficult to stop but preventative steps can be taken to minimize loss. The key to successful locust control is making sure you have the treatment in place for when they arrive. This timing depends on which type of locust problem you are experiencing. If you are an avid gardener which experiences locust damage and activity every year, you have a local population which needs to be eliminated. 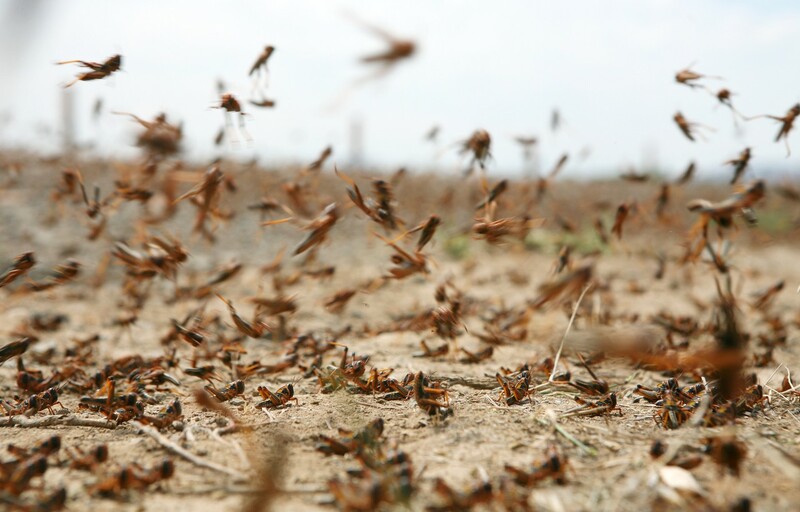 If you are in a region which generally has very little activity but migrating locusts are headed your way, immediate action is needed to minimize damage and followup treatments recommended to prevent population establishments. The time of the year will dictate what you need to do and which products to use but there some general guidelines to follow. To get prepared for the upcoming season, apply BIFEN GRANULES to your turf at the end of winter or early spring. These slow releasing granules will kill off young locust nymphs as they emerge from eggs. This will help minimize their presence in the yard. And without developing activity, there won’t be active scent which tends to lure nearby locusts to one location. Locusts are rugged and cold tolerant so they one of they’re one of the earliest insects to get active in spring. For this reason its important to have protection in place even though it might feel too cold for insects to be active. 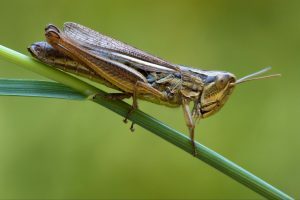 Gardeners and property owners who know about ongoing problems with locusts need to make special note when they typically arrive to get ahead of the “sure to develop” problem. 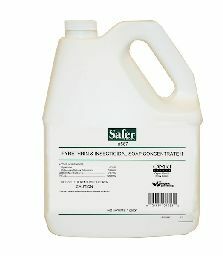 Bifen uses a strong active that will slowly release into the turf for 30-60 days. Plan on applying some monthly for bad problems; once every 2-3 months once things are under control. Use 1.5 lbs per 1,000 sq/ft of turf and use a good fertilizer spreader to make the application. Bifen can be used in flower beds, mulch areas and all turf. Bifen can be used in flower beds, mulch areas and on any type of grass too. For tight areas where you can’t fit a push behind spreader on wheels, get SCATTERBOX SPREADER. 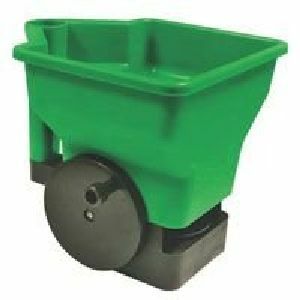 This easy to hand held spreader can be carried anywhere its needed. As spring turns to summer, watch local locust activity on your property. If you’ve gone more than 2 months without treating and locusts start appearing , put out more granules and spray using the XTS listed below. As stated above, locusts are “tough”. Their hard shell protects them from the environment, predators and even chemicals. But there are some formulations strong enough to get through their hard outer casing. And one of the best is BIFEN XTS. For active locusts, treatments will take affect in a few hours. It will also repel them from treated areas and provide several weeks of protection. But when swarms hit, be ready to spray as quickly as they come back. So if you see them repopulating within a few days of spraying, spray again. Bifen mixes with water easily and as an oil based concentrate, is naturally penetrating. Use 1 oz per 5 gallons of water per 5,000 sq/ft. For maintenance, spray once a month. When locusts are active, plan on spraying as needed which could be a few times in one week during the initial surge. For most any yard, a good HOSE END SPRAYER will be the way to spray. Its easy to use and connects to your garden hose so there is no mixing required. For locusts, add 1 oz of Bifen XTS to the sprayer. Next, add enough water to fill up the sprayer to the 5 gallon line. Now attach it to your garden hose and use the entire amount over 5,000 sq/ft. For 10,000 sq/ft, add 2 oz of Bifen and fill it to the 10 gallon line. 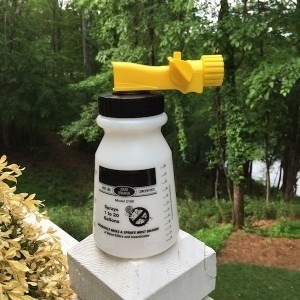 This sprayer works by slowly siphoning out the mixture in the tank and adding it to the water you’re spraying. 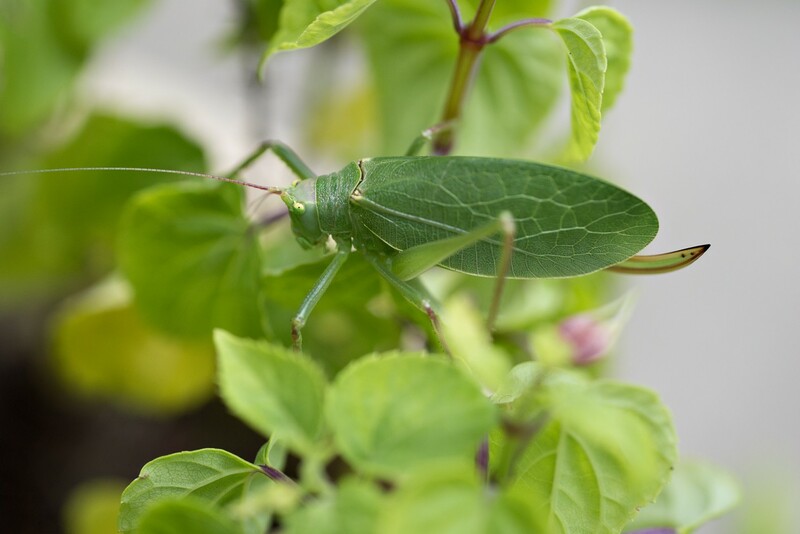 Locusts love vegetable gardens and are just as likely to target them for food as they will any other plant. Unfortunately Bifen is too strong to use in these areas. So if you have a problem in your garden, use VEGETABLES PLUS PERMETHRIN instead. Veg Plus uses a form of permethrin gentle enough to be used on fruits and vegetables meant to be consumed. And you can spray right up to 7 days before harvest. Add 1/2 oz per gallon of water and use the mixture on any vegetable or fruit producing plant. Coverage will be about 500-800 sq/ft per mixed gallon. You can use the garden hose sprayer above to apply the Permethrin. Just add 2.5 oz to the sprayer and then fill it to the 5 gallon line to create enough to cover up to 2500 sq/ft. For small gardens, use a good PUMP SPRAYER. 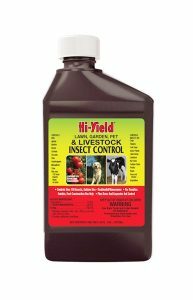 For the organic gardener, MULTI PURPOSE INSECT KILLER is approved for organic gardens and still strong enough to handle tough locusts. Add 6 oz per gallon of water and expect treatments to work within 30 minutes. Multi Purpose is safe enough to be used right up to 1 day before harvest so you can consume your harvest the day after you spray. 05-18-2012 Franklin county, Virginia. This year seems to be the worst ever for locust are are loud! I have 12 fruit trees, peach, apple, plum and pear. They are loaded down this year but unless I can find a way to get rid of the locust, I will have no fruit. What’s an economical way to get rid of them? For fruit trees and vegetables, we recommend the Cyonara RTS. You can hook it up to your garden hose and use the water pressure coming from the home which works really well for big treatments like trees. And the Cyonara goes a long way and is labeled for use on plants that yield edibles. Somehow I have gotten a locust in my air duct of my home. It is so loud and I can’t pin point where it is for sure. Just in the air duct somewhere. I have tried everything to make it die or leave. I have turned the air way low to freeze it to death, turned the air off on a couple days it was like 100 degrees out hoping it would get so hot it would die. I have tried spraying Raid bug spray in the vent attached to the air duct. The vent and duct are on the ceiling and I sprayed so much Raid that I about affixiated myself!!! The damn locust still kicking it!!! I swear it is satan’s spawn and it is never going to die or shut the hell up!!! It is so loud I can’t even sleep!! It has been almost 2 weeks now and I am only gettng like 1 or 2 hrs of sleep a night!! I need this thing to DIE!!!!! I go to school full time and work 2 jobs. I need my peace and quiet back again!! Is there a spray or trap or granuals or chemical bomb I can use to get rid of it? PLEASE HELP ME!!!!!!!! Locusts can and will enter homes. And if they get stuck, their sounds can be annoying. But its not likely this one is actually “in your vent”. What’s most likely (I have seen it happen many times) is that one entered a gap somewhere on the home. This gap could have been around a gutter line behind the facia board. Or maybe just under the roof line where it overhangs above the gutters. Or maybe around an attic vent. Regardless of where it entered, one got into your attic. And once it got inside, it got stuck. From there it could have crawled anywhere. Now if it landed on any section of duct work which runs throughout most of your attic, it would find the spot to be much like a tree. Duct work is round in shape, easy to hold onto and basically very much like the trunk of a tree. And in the “foreign land” of your attic, the only shape a locust would find to be natural and comfortable. For this reason it would no doubt like clinging to the duct and probably stay there during its visit. Now since the inside of the duct work is hollow and ready to accept a sound, any kind of animal or insect siting on it projecting sound would be heard through that duct’s vent port. So if I was a betting man, I’d put my money on this pest being somewhere on the duct above the vent where you hear it. Now it could be 5, 10 or even 20 feet away. But no kind of contact spray directed into the duct would kill it. So what options do you have? Fortunately there are what we call “space sprays”. And we have attic dusts. Either would be able to get this pest no matter where its hiding and here is a brief description of how each option works. No doubt the simplest solution would be to get a can of Metered Insecticide and an Aerosol Machine. The machine accepts the Metered Insecticide which is a space spray. The machine needs a couple of double A batteries and will be fitted with the Metered Insecticide. You’d then go up into the attic, turn it on and place it direct above and as close to the vent as possible where you hear the sound. The machine will then start to release a small blast of pyrethrin based chemical every 15 minutes. This would kill any insect in the a good 400 sq/ft range (that’s 20 feet by 20 feet). So any pest in the immediate area would eventually succumb to the treatment and die. I expect this would happen in 2-3 days once the machine is deployed. The next, more complete option would be to dust the attic. We commonly sell this solution for attic pests like scorpions, roaches and silverfish. Basically the goal with this approach is to cover the entire attic space with an insecticidal dust so any insect active in the treated area will walk over the treatment, pick up the dust and die. After the treatment is in place, I suspect your unwanted guest would be dead in 3-5 days. The other benefit of this approach is that the dust will last 6-12 months. During this time it would effectively take care of anything that might be up there and is generally a smart thing to do for any attic likely to get insect pests. Now you will need a Dustin Mizer to apply the Deltamethrin Dust but its well worth the investment. No doubt the dust treatment is more direct compared to the aerosol and it will cover the entire attic so there will be no place for this pest to hide.